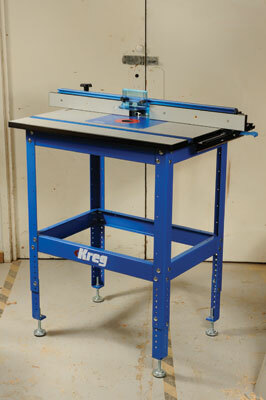 Kreg's precision router table is a self-assembly package and although not technically challenging, building it is not a five minute job. Four hours start to finish it took me and yes, I say this through gritted teeth. The instructions are clear and everything is listed in the manual although still in imperial. As pressed steel frames go it's really quite substantial and forms a heavy, rigid platform. There's no tooling provided so you will need a cranked ring spanner or deep socket to avoid scraped knuckles. The frame components are pre-drilled so attaching panels to create a cabinet would be an easy option. The fixing kit includes a square head driver for some of the screws but it's not quite long enough without an extension to reach through the frame. Attaching the machine of your choice to the table insert is made easier by the template supplied but still requires your full attention. Phenolic resin is a tough material and the top surface can easily splinter. A pair of centre insert rings are supplied and like the main insert can be levelled and locked down with reasonable success. The optional brass lead-in pin supplied for curved work is fixed i.e. it does not rotate. Mounted on one end of the table the aircraft grade anodised aluminium fence can be set accurately to run parallel with the mitre slot. The scale can be zeroed and the whole assembly locked down at both ends. 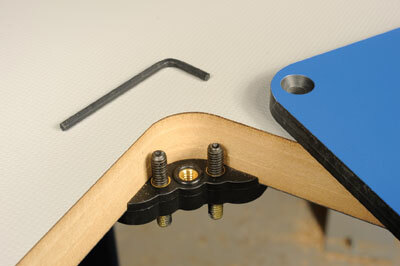 Three-point adjusters are fixed in each corner of the table insert opening. 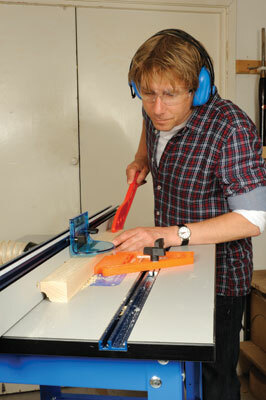 The time spent levelling the insert will pay dividends the moment you begin to use the table. The kit comes with adjustable feet so you can achieve a comfortable working height between 787 and 914mm. As an optional extra you can mount the frame on a pair of lock down castors. A pair of acrylic rods are supplied to advance the outfeed fence for edge trimming, effectively turning the table into a small planer. Underneath the table, either side of the opening there are pressed steel bars to give added rigidity. The table top has a low friction Micro-Dot surface, which eliminates any unnecessary drag. There's nothing on this table system that you haven't seen before so nothing much to get excited about until you start using it. You will have to spend some time tuning a few settings but when done everything works as it should and it lives up to its name; a precision router table. I did, however, find the extraction spout too short to fit a hose over and clip it in place securely.